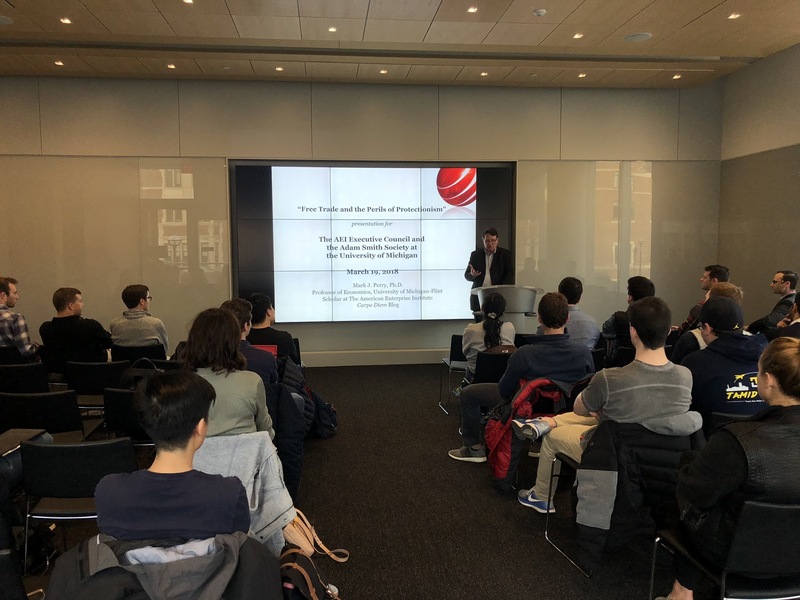 On Monday, March 19th, American Enterprise Institute (AEI) Scholar Dr. Mark Perry gave a talk at the Ross School of Business entitled “Free Trade and the Perils of Protectionism.” It was organized by the University of Michigan AEI Executive Council and the Adam Smith Society Chapter at the University of Michigan. Much of his focus in the presentation was on free trade and the recently imposed tariffs on steel and aluminum enacted by the Trump Administration. The tariffs signal a president that is more sympathetic to protectionism, a policy which many fiscal conservatives have denounced for years, as it restricts the market and free trade rather than leave the market unchanged. “Too often exports are seen as Team America’s points and imports are seen as Team Foreign Country’s points.” He explained that we should measure economic prosperity by viewing both exports and imports as a positive.He also discussed how tapping into the law of comparative advantage, the idea that countries can make certain products more efficiently than others, allows us to trade efficiently and best help consumers and make sure that they are put first. Most notably, he defined trade deficits and explained why they are positive aspects of the economy contrary to the President’s opinion and many others. “Think of the US like a house. If more goods came in then went out, that would be a good thing.” He also explained that our trade deficits are balanced out by the surplus we gain from foreign investment money made in exports. This makes up for any “loss” the US may have incurred and allows consumers to acquire the best products at the cheapest price. Perry then discussed the sugar industry, which benefits heavily from protectionist policies, and their decades-long lobbying for quotas on foreign sugar. He estimated that the protectionist policies put in place for sugar cost American consumers nearly $3 billion in 2012 alone, and that the average price for a pound of sugar in the US is nearly $0.20 higher than the rest of the world. In addition to being an AEI Scholar Dr. Perry also serves as a part time professor at the University of Michigan— Flint Campus, as well as a main writer for the blog Carpe Diem. His blog adamantly promotes free trade and attempts to educate others about economic policy in the news and the importance of free trade. Dr. Perry’s writings have appeared in The Wall Street Journal and the Washington Examiner. His blog has continued to be a prominent aspect of the American Enterprise Institute’s mission on Macroeconomic policy, and his work at the institute as well as at the University of Michigan have become vital for many conservatives on how to see the economy.